When I tell people that we have a snail problem, and that we fill buckets of snails on a fairly regular basis, I can sense that they think I am exaggerating. 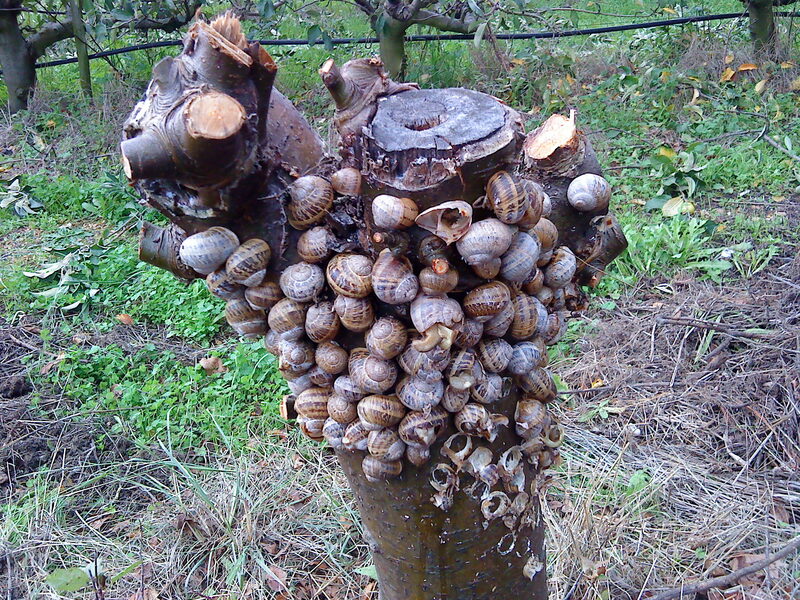 I thought I would show you this picture taken last year – the apple trees have been sawn down and the snails have collected on the tree trunks for their winter sleep! Makes collecting them so much easier! You can imagine what they would do to a collection of bags filled with newly planted delphiniums! I just don’t grow them any more. In the older section of the garden the problem is much less, but where we have pulled out apples trees to expand the nursery or garden, the problem is pretty severe. Try counting them! Snails clustered on apple tree trunk.